Xu, Z., Chen, T., Ding, Z., Hu, X., and Nie, G. (2019). "Effects of magnesium impregnation on stability and sorption performance of biochar derived from sawdust and corn husks," BioRes. 14(1), 289-301. Biochar was derived from MgCl2 and MgO pretreated sawdust and corn husks at 300 °C and 600 °C, respectively, to investigate the effects of exogenous minerals on the stability and sorption performance of the resulting biochar. Impregnation with Mg decreased carbon concentration, increased yield and ash concentration, and increased the pH values at the point of zero charge (pHPZC) of the resulting biochar. The chemical stability of biochar oxidized by K2CrO7 was enhanced with increasing pyrolysis temperature and decreased with the pretreatment of MgCl2 and MgO. Mg-impregnation enhanced carbon loss of the resulting biochar and increased the sorption capacity of biochar for CR significantly, which is potentially caused by electrostatic interaction and surface complexation. This study indicates that magnesium-impregnation significantly enhances the sorption performance of anionic contaminants and the pyrolysis temperature has a greater effect on the stability of the resulting biochar than the magnesium-impregnation. Biochar is generally produced through the slow pyrolysis of biomass feedstock under oxygen-limited conditions. Biochar has excellent potential in carbon sequestration, improvement of soil fertility, environmental remediation/restoration, and wastewater treatment (Xie et al. 2016; Inyang et al. 2016). The stability and sorption performance of biochar are important parameters for their application in carbon sequestration, soil remediation, and wastewater treatment, which are dependent on the physicochemical properties of biochar. Chen et al. (2016) report that the chemical oxidation stability of bamboo biochar is improved with increasing pyrolysis temperature between 300 °C and 700 °C. Singh et al. (2012) found that the plant-based biochar was more stable than manure-based biochar. Mineral elements play an important role in the stability and sorption performance of biochar. For example, minerals have a greater influence than organic components on the surface electrochemistry and ion exchange properties of plant-based and municipal waste-based biochar derived from twelve types of biomass feedstock (Zhao et al. 2015). To obtain biochar with more abundant minerals, exogenous minerals have been added to design engineered biochar (Xie et al. 2016). For example, Xu et al. (2017) reports CaCO3 and Ca(H2PO4)2 as additives enhance the stability of sewage sludge biochar. Hu et al. (2015) demonstrate that a pretreatment of biomasses with metal salts (e.g., magnesium salts, iron salts, and aluminum salts) effectively improve the adsorption capacities of the resulting biochar (Hu et al. 2015). The hydrolysis and decomposition of MgCl2 in the MgCl2-pretreated biomass under different pyrolysis temperature result in MgO, Mg(OH)2, and Mg salts, which may modify the physicochemical properties of the resulting biochar. In this study, sawdust and corn husks were pretreated with either MgCl2 or MgO. The Mg-impregnated biochar specimens were prepared at a pyrolysis temperature between 300 °C and 600 °C. The objectives of this study were: (1) to investigate the release of dissolved organic carbon and Mg from biochar; and (2) to evaluate the chemical stability of carbon in biochar using K2CrO7 oxidation, and the sorption performance through batch sorption of methylene blue (MB) and Congo red (CR). The sawdust and corn husks were collected from a local sawmill and a grain processing factory in Nanjing, China. They were washed and then crushed into samples smaller than 1 mm, and finally they were soaked in either MgCl2 or MgO solution (mass ratios of Mg to biomass = 1:10). Subsequently, the supernatant was removed after 24 h, and mixtures were dried at 85 °C for 24 h. The sawdust biochar (SB) and corn husk biochar (CB) were pyrolyzed in a tube furnace (OTF-1200X, HF-Kejing, Hefei, China) under a nitrogen atmosphere and marked as SB3 and CB3 or SB6 and CB6 corresponding to the pyrolysis temperatures of 300 °C for 4h, and 600 °C for 2h, respectively. Sawdust and corn husks pre-treated with MgCl2 (MC) and MgO (MO) were also pyrolyzed following same condition and the resulting biochars were marked as MC/SB3 and MC/CB3, MC/SB6 and MC/CB6, MO/SB6, and MO/CB6. Biochar yield was calculated using the mass ratios of the resulting biochar to biomass feedstock. The ash content of the resulting biochar was measured by ashing biochar in a muffle furnace at 550 °C for 5 h. The content of carbon (C), hydrogen (H), and nitrogen (N) of biochar were measured using an Elemental Analyzer (Carlo-Erba NA-1500, Hanau, Germany). The pH value at the point of zero charge (pHPZC) of the biochar was determined using the impregnated pH drift method. The functional groups of the biochar were characterized using a Fourier Transform Infrared Spectrometer (NEXUS870, NICOLET, Boston, MA, USA). The crystallographic structures of the biochar were determined using an X-ray Diffractometer (CAD4/PC, Enraf Noius, NED, Geneva, Switzerland). The thermal stability of the biochar was analyzed using a Thermogravimetric (TG) analyzer (DTA449F3, NETZSCH, Selb, Germany) under a nitrogen atmosphere and heated to temperatures between 25 and 700 °C. One g of biochar, derived under 300 °C, was added to 50 mL of deionized (DI) water in a 50 mL centrifuge tube and shaken at 25 °C for five different time intervals (1, 2, 4, 8, and 24 h). The centrifuge separated the solid and liquid phases, which were then filtered through a 0.22 μm membrane. The dissolved organic carbon (DOC) in the filtrate was analyzed using a total carbon analyzer (TOC-L/CPH, SHIMADZU, Kyoto, Japan) and the releasable Mg in the filtrate of the 24 h extraction was analyzed by an inductively coupled plasma optical emission spectrometer (ICP-OES) (Optima 5300, PerkinElmer, Waltham, MA, USA). where M0 and M are the mass of biochar before and after the oxidation treatment (mg), respectively, N0 and N (%) are the carbon concentrations in the biochar before and after the oxidation treatment (%), respectively, and W is the C loss ratio. where qe is the equilibrium absorption capacity (mg/kg), Co and Ce are the initial and equilibrium concentrations (mg/L of MB and CR, resprctively; V is the volume of solution (L), and m is the mass of biochar (g). Table 1 shows that the pyrolysis temperature had a significant effect on the elemental composition of the resulting biochar. An increase in the pyrolysis temperature resulted in the decrease in the concentration of O and H, while the concentration of C and ash increased (Table 1). Additionally, Table 1 showed that the mineral addition played an important role on the elemental compositions of the resulting biochar. For example, Mg concentrations in the resulting biochar increased with the increased pyrolysis temperature (from 300 °C to 600 °C) (Table 1). Biochar derived from the MgCl2-pretreated biomass feedstock had higher concentrations of ash and O, with lower concentrations of C than those from origin biomass feedstock. Similar results were also observed for the pretreatment of MgO (Table 1). Concentrations of N were low, and they changed only a little among the resulting biochars (Table 1), which were reported that no nitrogen-containing substances were formed (Gaskin et al. 2008). The H/C, O/C, and (O + N)/C ratios indicated the aromaticity and polarity of biochar (Azargohar et al. 2013). With the increasing pyrolysis temperature, the H/C, O/C, and (O + N)/C obviously decreased (Table 1), which indicated that the aromaticity increased and polarity decreased at 600 °C. The concentrations of ash for Mg-impregnated biochars were higher than that in the pristine biochar, which were consistent with the increasing Mg concentrations in the biochars (Table 1). However, the pretreatment of MgCl2 and MgO had different effects on element composition and yield of the resulting biochar (Table 1). The mineral elements, such as K, Ca, and Na, were also found in the biochars at relatively low concentrations compared with other tested elements of biochars. The pHPZC of the biochar was an important indicator of the surface charge of the adsorbent. 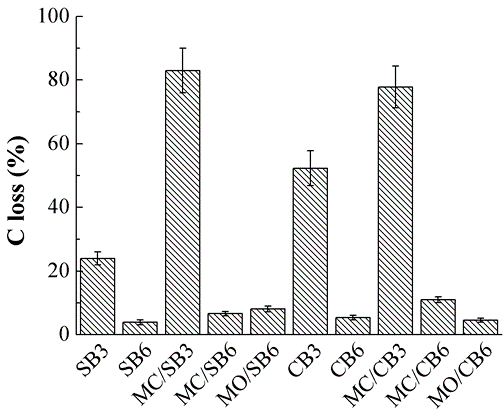 The pHPZC of the studied biochar were in the order of MO/SB6 (10.6) > MC/SB6 (10.4) ＞MC/SB3 (8.8) ＞SB6 (8.5) ＞SB3 (7.4) for sawdust-based biochar, and MO/CB6 (10.4) = MC/CB6 (10.4) ＞ MC/CB3 (9.5) ＞CB6 (9.2) ＞CB3 (7.7) for corn husk-based biochar. The values of pHPZC for the resulting biochar increased as the pyrolysis temperature increased from 300 to 600 °C, and the values of pHPZC for the resulting Mg-impregnated biochar were higher than that in the pristine biochar, suggesting that the pretreatment of MgCl2 and MgO increased the pHPZC of the resulting biochars. Therefore, all Mg-impregnated biochars showed surface positive charges in acid, neutral, and weak alkaline solutions, which is beneficial for the sorption of anionic contaminants. The FT-IR spectra of biochars are shown in Fig. 1(a). The peak at 3698 cm-1 in MO/SB6 and MO/CB6 could be assigned to Mg-OH, but this peak was not observed in other biochars. The peak at 3390 cm-1 was suggested to be –OH and disappeared with the increasing pyrolysis temperature, which might be due to the decrease of –OH. The peaks were assigned to –CH3 at 2900 cm-1, and –COOH at 1700 and 1600 cm-1 (Fig. 1(a)). The peak of –COOH became weak as the pyrolysis temperature increased, which indicated the reduction of the oxygen-containing functional groups. * Oxygen concentration (%) was calculated by mass difference between total mass and tested elements/ash. The peaks in the 1400 and 880 cm-1 regions were assigned to aromatic C-O and aromatic C-H functional groups, respectively. The broadband in the 788 to 881 cm-1 region was related to the bond stretching vibrations of –CH2 and C=C-H. There were no significant differences between the FT-IR spectra of the pristine sawdust-based bichars and that of the pristine corn husk-based biochars (Fig. 1(a)). The increasing pyrolysis temperature reduced surface functional groups and the addition of Mg had no significant changes on surface functional groups (Fig. 1(a)). The XRD spectra of biochar is shown in Fig. 1(b). The peak of all biochars at 2 theta of 23° was generally identified as the crystal structure of cellulose; however, there were no obvious peaks, which suggested that there was no crystalline cellulose in the resulting biochars. The peaks located at 2 theta of 37°, 43°, and 62° in MC/SB6, MO/SB6, MC/CB6, and MC/CB6 were assigned to crystalline MgO (periclase) (Fig. 3), as stated in previous reports (Liu et al. 2013). The peaks at 2 theta of 18°, 50°, and 58° were identified as Mg(OH)2 in MO/CB6, MO/SB6, and MC/SB6 (Fig. 1(b)), as supported by previous reports (Xu et al. 2018). No peaks were found in MC/CB3 and MC/SB3, which may be due to crystalline minerals in biochars below the detection limit of XRD or no crystalline minerals at 300 °C (Fig. 1(b)). Additionally, there were no crystalline minerals in the pristine biochars derived from feedstock without the pretreatment of MgCl2 and MgO. Fig. 1. Spectra of FT-IR (a) and XRD (b) (M, Mg(OH)2; C, cellulose; P, MgO). The release kinetics during the 1 to 24 h of DOC from SB3, CB3, MC/SB3, and MC/CB3 are presented in Fig. 2. The release of DOC arrived at an equilibrium within 4 h. Therefore, the release of DOC from all studied biochar was set as 24 h time interval. The releasable concentrations of DOC from biochar (mg g-1) after the 24 h extraction were in the order of MC/SB3 (14.5)＞MC/CB3 (9.66)＞SB3 (1.84)＞SB6 (0.63)＞MC/SB6 (0.54)＞CB3 (0.52) = MO/SB6 (0.52)＞CB6 (0.47)＞MC/CB6 (0.41)＞MO/CB6 (0.39). These results suggested that the releasable concentration of DOC in biochar decreased as the pyrolysis temperature was increased. The highest releasable concentration of DOC (14.5 mg g-1) were found from MC/SB3, followed by MC/CB3, indicating that the pretreatment of MgCl2 increased the release of DOC of biochar at the pyrolysis temperature of 300 °C. The releasable concentrations of Mg after a 24 h extraction were 0.056, 0.041, 15.1, 1.73, 3.22, 0.34, 0.20, 16.7, 4.02, and 3.35 mg g-1 for SB3, SB6, MC/SB3, MC/SB6, MO/SB6, CB3, CB6, MC/CB3, MC/CB6, and MO/CB6, respectively. These findings indicated that soluble Mg was present in the bichars. Thermosgravimetric analysis (TGA) was carried out under a nitrogen atmosphere to evaluate the thermal stability of the biochar (Fig. 3). The biochar pyrolyzed at 300 °C had a 25% to 35% weight loss at temperatures from 100 to 700 °C (Fig. 3). However, biochar pyrolyzed at 600 °C only had a 3% to 10% weight loss at temperatures from 100 to 700 °C (Fig. 3). The thermal stabilities of biochar followed the following order: SB6 ＞CB6 ＞MC/SB6 ＞MC/CB6 ＞MO/CB6 ＞MO/SB6 ＞SB3 ＞CB3 ＞MC/CB3 ＞MC/SB3. The results suggested that the thermal stability of biochar improved as the pyrolysis temperature increased. The MgCl2 and MgO impregnated biochars reduced the thermal stability compared to the pristine biochar. This indicated that the addition of Mg might increase the surface oxygen functional groups of the resulting biochars. The loss of C concentration in biochar via K2CrO7 oxidation is presented in Fig. 4. The loss of C concentration in biochars prepared at 300 °C was significantly greater than those at 600 °C (Fig. 4). The loss of C concentration in Mg-impregnated biochar prepared at 300 °C (MC/SB3 and MC/CB3) was significantly greater than those in the pristine biochar (SB3 and CB3) (Fig. 4). These results were consistent with previous reports (Chen et al. 2016) that state that the chemical stability of carbon is enhanced via the increasing pyrolysis temperature. The chemical stability of carbon may be related to releasable concentration of DOC (Fig. 2). For example, MC/SB3 and MC/CB3 had the highest carbon loss and releasable concentrations of DOC. DOC is unstable and easily attacked by K2CrO7 (Li et al. 2014). Results from the K2CrO7 oxidation indicated that the pyrolysis temperature was the key factor in the chemical stability of carbon in the biochar, and that the Mg-impregnation enhanced the carbon loss of biochar prepared at low pyrolysis temperature (300 °C). Sorption isotherms of CR and MB onto biochar are shown in Fig. 5. The adsorbed mass of CR and MB were increased with the increasing initial concentrations of CR and MB and then arrived at an adsorption equilibrium. Figure 5 shows that Mg-impregnation enhanced the sorption of CR and MB onto Mg-impregnated biochars significantly compared with the pristine biochars (SB3, SB6, CB3, and CB6). The sorption capacities of Mg-impregnated biochars for CR were considerably higher than that for MB, and the pristine biochar showed lower sorption capacities for both CR and MB (Fig. 5). To more aptly evaluate the sorption performance of biochar for CR and MB, the sorption isothermal data were fitted by using Langmuir and Freundlich isotherm models (Table 2). The coefficients of R2 for the Langmuir model for Mg-impregnated biochar were slightly higher than that for the Freundlich isotherm model, especially in MB sorption, which indicated that the Langmuir and Freundlich isotherm model fitted well with the experimental data. The Freundlich parameter, 1/n, can reflect the sorption intensity (Fan et al. 2017). Values of 1/n were between 0 and 1 for all biochar in this study (Table 2), indicating that the sorption was favorable for CR and MB. 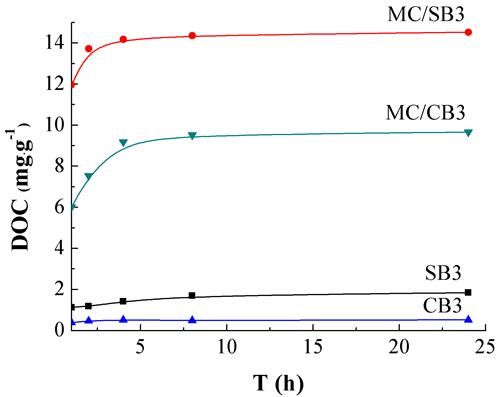 MC/SB3 and MC/CB3 exhibited the greatest sorption performance for both CR and MB. For example, MC/SB3 and MC/CB3 had Langmuir maximum sorption capacities of 534 and 518 mg g-1 for CR, and 63.6 and 71.1 mg g-1 for MB, respectively. The MC/SB6, MO/SB6, MC/CB6, and MO/CB6 showed higher sorption capacities for CR, which were also far higher than that for MB (Table 2). The Langmuir maximum sorption capacities of MgO-pretreated biochars (MO/SB6 and MO/CB6) for both CR and MB were higher than that of MgCl2-pretreated biochars (MC/SB6 and MC/CB6). Moreover, the separation factor of the Langmuir model (RL, RL = 1 / (1 + KL * C0), a dimensionless constant, classiﬁed the adsorption to be favorable (0 < RL< 1), unfavorable (RL > 1), and linear (RL = 1) or irreversible (RL = 0). The value of RL was between 0.02 and 0.34 for CR, and 0.02 and 0.11 for MB, which suggested favorable adsorption for CR and MB in biochar. Different sorption mechanisms were involved in the sorption of CR and MB. In this study, the pHPZC of biochar (between 7.4 and 10.6) was higher than the experimental solution pH (around 7); therefore, biochar contained surface positive charges for the favorable sorption of anionic contaminants. Congo red is an anionic dye and MB is a cationic dye. Therefore, biochar with surface positive charges was favorable for the sorption of CR, and unfavorable for MB. The difference between Langmuir maximum sorption capacities for CR and MB suggested that electrostatic interaction may be an important mechanism for CR sorption. Compared with the pristine biochar (SB3, SB6, CB3, and CB6), Mg-impregnation improved the Langmuir maximum sorption capacities of biochars for both CR and MB. The FT-IR spectra showed that MC/CB3, MC/SB3, MC/CB3, and MC/SB3 had more abundant surface containing functional groups than MC/CB6, MC/SB6, MO/SB6, and MO/CB6 (Fig. 1). It is reported that the groups of –COOH and –OH have a specific role for dye (Xu et al. 2011). MC/SB3 and MC/CB3 had the greatest sorption capacities for both CR and MB, suggesting that complexation may be involved in the sorption and hydrophobic interaction and ԉ-ԉ interactions may be not important sorption mechanisms of CR and MB. It can be inferred that electrostatic interaction is the main mechanism for CR sorption, followed by complexation in this study; while complexation is the main mechanism for MB sorption. The chemical and thermal stability of biochar are important parameters for its environmental application. The chemical stability of biochar was investigated using K2CrO7 oxidation to show that a higher pyrolysis temperature could enhance its chemical stability, while Mg-impregnation could decrease the chemical stability. This would be especially true for biochar prepared at a low pyrolysis temperature (300 °C) (Fig. 4). The thermal stability was investigated using thermosgravimetric analysis to show that the thermal stability of biochar could be improved by increasing the pyrolysis temperature and that Mg impregnation could reduce the thermal stability (Fig. 1), which were consistent with the chemical stability. It is reported that higher pyrolysis temperatures remove the low thermal resistance components, increase cyclic oxygen functional groups such as carboxylic anhydrides (460 °C), hydroxyl (570 °C), and lactones (720 °C) with high thermal resistance, and enhance aromaticity of biochar (Tan et al. 2015; Xie et al. 2016). For example, the atomic ratios of O/C, (O + N)/C, and H/C are used to reflect the bulk hydrophilicity, polarity, and aromatization of biochar. In this study, The H/C values of biochar under 600 °C were lower than that in other biochar, indicating that biochar under higher pyrolysis temperature exhibited higher chemical stability (Table 1). The chemical stability of biochar is generally positively related to their thermal stability. Higher ash concentrations decreased the aromatic carbon of biochar, which reduced the stability of carbon in biochar. However, ash content has a positive effect on metal sorption (Guo and Chen 2014). The more oxygen-containing functional groups in the biochar, the weaker the stability of the biochar. But the oxygen-containing functional groups may play an important role in sorption of certain contaminants, owing to surface complexation with contaminants (Inyang et al. 2016). In this study, Mg-impregnation improved their Langmuir maximum sorption capacities of biochar for both CR and MB, and MC/SB3 and MC/CB3 have the highest sorption capacities for CR and MB. 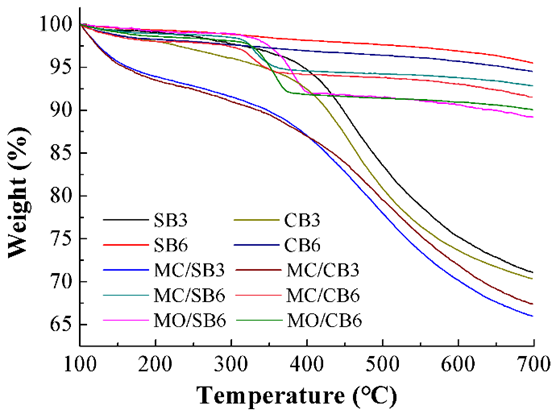 However, MC/SB3 and MC/CB3 showed a lower chemical and thermal stability. Therefore, the chemical and thermal stability of biochars may be not positively related to their sorption performance. This data suggests that high stability of biochar does not lead to favorable sorption performance. MgCl2 and MgO pretreatment can increase the contents of Mg, yield, pHPZC, and ash and decrease the C contents in the resulting biochar. Magnesium-impregnation decreased the chemical oxidation stability of the resulting biochar at low pyrolysis temperatures (300 °C) compared to the pristine biochar. MgCl2 and MgO impregnated biochar had high sorption capacities for CR and MB, but especially for CR because it is an anionic contaminant. Magnesium-impregnation and low pyrolysis temperature are favorable for the preparation of sorbents with high sorption capacities of anionic contaminants. This work was supported by the National Natural Science Fund of China (No. 21677075, 21507060). Gaskin, J. W., Steiner, C., Harris, K., Das, K. C., and Bibens, B. (2008). “Effect of low-temperature pyrolysis conditions on biochar for agricultural use,” Transactions the Asabe 51(6), 2061-2069. Li, X., and Cao, Y. Chemical Formula Manual. 1987.12, Science Press, Beijing (in Chinese). Article submitted: July 14, 2018; Peer review completed: October 11, 2018; Revised version received and accepted: November 1, 2018; Published: November 16, 2018.